KIEV, Ukraine -- As football fans prepare for the final of Euro 2012, allegations of corrupt practices continue to haunt the host nation and its leaders. UEFA President Michel Platini (top centre), with Ukraine President Viktor Yanukovych (top right), at the Donbass Arena stadium in Donetsk. As Kiev prepares for the last act of Euro 2012 – tonight's final between Italy and Spain – the country is reflecting on a tournament that went a lot better than many expected in terms of organisation and fan experience. But attention is now turning to corruption allegations surrounding President Viktor Yanukovych and his government. The government spent around £6 billion ($9.4 billion) on preparations for the Euros according to some estimates. 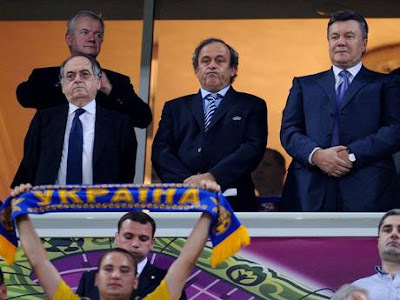 But having cancelled competitive tenders set for contracts to build stadiums and infrastructure, critics say that up to 40 per cent of the cash could have been pocketed by people in Mr Yanukovych's inner circle. Kiev's Olympic Stadium, the venue for tomorrow's final, is at the centre of the controversy, with over half a billion euros ($634 million) allegedly spent on its reconstruction, carried out through a series of shell companies with no clear indication of who the final beneficiaries are. "This government sees its power not as a service for the people but as a resource for profit for its members and their families," said Ostap Semerak, an opposition MP and member of the shadow cabinet of Yulia Tymoshenko. "The construction projects for the Euros are simply part of a scheme to launder money in cash inside Ukraine." Ms Tymoshenko, the former prime minister and one of the leaders of the 2004 Orange Revolution, was jailed last year on charges that most people saw as political revenge by Mr Yanukovych, who narrowly defeated her in a presidential poll in 2010. Since he came to power, Mr Yanukovych has surrounded himself by businessmen and associates from his home city of Donetsk. Especially close to him are oligarchs such as Rinat Akhmetov, the president of Shakhtar Donetsk football club, and his right-hand man, Boris Kolesnikov, the Deputy Prime Minister who was in charge of the organisation for Euro 2012. There are also shadowy figures such as Dmitry Firtash, an oligarch who made millions through an interim company that dealt with Russian gas transit and has been linked with corrupt practices and organised crime figures in Russia, charges he has always denied. "It's an open secret that there are high-ranking politicians behind these companies," said a Western diplomat in Kiev. "Something like 30-40 per cent of the state money spent on the tournament has gone into the pockets of politicians. They did everything they could to siphon the money into their pockets." Mr Kolesnikov, the Deputy Prime Minister, says that such allegations are nonsense. He denies all claims of corruption around the Euros and says that the real figure spent by the government was around £3 billion ($4.7 billion). Mr Kolesnikov is thought to be worth hundreds of millions of pounds personally, having accumulated a fortune in Donetsk over the past two decades. Mr Semerak and others claim that he personally has profited from the infrastructure development around the Euros, charges which he denies vehemently. He was arrested in 2005 on charges of abuse of office and making a death threat. He also denied all of those charges, which were later dropped. "It's in Ukrainian traditions to pour dirt over your opponents," he said in an interview on the balcony of his office, a lavish suite of rooms in a government building in central Kiev. "If you want to talk about corruption, the first place to look is to the government of Yulia Tymoshenko. When we came in, in March 2010, we only had a year and a half left, and there was not a single project in place." He says the Olympic Stadium reconstruction cost about €430 million ($545 million), which is a "completely normal amount" for such a project. "Reconstruction is more expensive than building a new stadium – look at how much Wembley cost," he said. The fractious nature of Ukrainian politics, where fist fights frequently erupt in parliament and opposing sides hurl vitriol at each other on a regular basis, makes it hard to dissect the mutual allegations and accusations from a neutral perspective. But most Western observers agree that things have taken a turn for the worse under the Yanukovych administration. "Tymoshenko was certainly no white swan, and there were real issues about corruption within her government as well" said the Western diplomat in Kiev. "But in the past two years there has been a real deterioration." Mr Semerak points to several instances of what he claims amounts to corruption and mis-spending, such as the infamous case of wooden benches purchased for the metro system in the city of Kharkov which cost several thousand pounds each, with most of the money presumably disappearing into someone's pocket. He also mentions a helicopter port built with money earmarked for Euro 2012 near a popular hunting spot in central Ukraine, with the justification being that teams may want to stop off for a rest there if they were flying between venues by helicopter. Most troubling, however, is the role of companies such as Altkom, a shadowy entity based in Donetsk with a murky ownership structure, that nevertheless won more than half a million pounds ($0.78 million) worth of government contracts for construction projects related to the Euros. Local reporters tracked down the nominal head of the company, who turned out to be a yoga teacher in Cyprus named Lana Zamba. Her husband said she was simply paid a nominal sum to sign off on documents saying she is a director of Altkom and a number of other companies. Nobody knows who the real financial beneficiary is. Mr Kolesnikov brushed away concerns about Altkom, saying it is "the biggest such construction company in Ukraine". When confronted about how a yoga teacher from Cyprus could possibly be in charge of such a huge company, he said he did not know who the ultimate beneficiary was. "They operate within Ukrainian law, and that is what matters," he said. "The government of Ukraine is not obliged to find out who the owner of the company is, whether they are a yoga teacher or a maths teacher, it doesn't matter." He denied suggestions, voiced by the opposition, that he himself may have links to the company. Anti-corruption organisation Transparency International put Ukraine at 152nd place in its most recent global corruption survey, below Nigeria, Togo and Pakistan and some European politicians are demanding that Mr Yanukovych's government explains where the money went. Two German MEPs have written to UEFA's President, Michel Platini, with a number of questions over the cancellation of tenders and the opaque accounting practices employed by the Ukrainian authorities. "Not only would it mean a damage to UEFA's image if the cancellation of competitive tendering was tolerated just to ensure the final round could start on time, but UEFA would act against its own assertions if it tolerated such practices by looking the other way," said the letter. In a written response, Mr Platini essentially said that concerns over corruption were not the business of UEFA. "We concentrate solely on the sporting domain, and we do not have the authority, the capacity or the mandate to judge or audit the way in which a country manages the construction of tournament or other infrastructure," he wrote. Mr Kolesnikov says UEFA is "delighted" with Ukraine, and says only one thing went wrong at the tournament. "The fans loved Ukraine, UEFA are happy, the only thing that was unfortunate was that the Ukrainian football team didn't make it to the later stages." Ukraine's President grew up in the mining town of Donetsk and was jailed twice in his youth for assault. He won an election in 2004 that observers said was rigged and ushered in the Orange Revolution. Six years later, he became president again. He has recently been making headlines over a state-owned country mansion that he has "privatised". Firtash owns a number of power and energy businesses but is best known as the co-owner of RosUkrEnergo, an opaque company that acts as a middle-man in gas transit through Ukraine from Russia to Europe. Cables released by WikiLeaks said that Mr Firtash told US diplomats that he had links to Russian organised crime structures, in particular the notorious Russian mafia overlord, Semyon Mogilevich, who is on the FBI's most wanted list. Like many other oligarchs, he has made efforts to "go respectable" in recent years, funding a Ukrainian Studies centre at Cambridge University. Akhmetov is Ukraine's biggest oligarch and was always seen as the economic power behind Mr Yanukovych. Despite allegations linking him to organised crime, Mr Akhmetov has won a number of libel cases against those who have accused him of underhand dealings. He is the Roman Abramovich of Ukraine, investing hundreds of millions of pounds into Shakhtar Donetsk, the country's best football team.